Colin should confront that supermodel Show ‘er who’s boss! 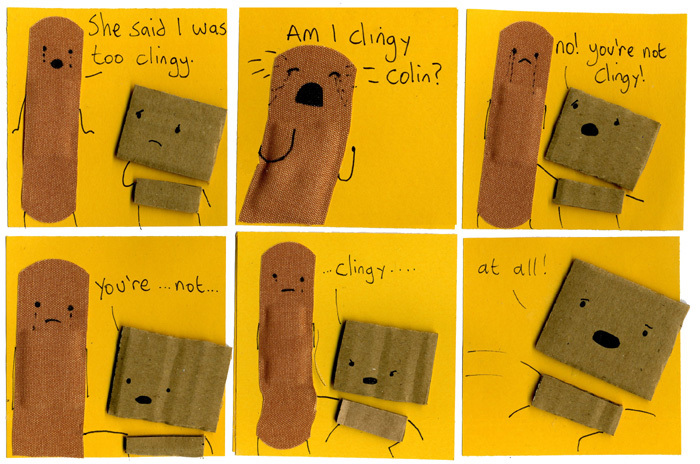 He couldn’t help that he was clingy, he did not even know that it was in his nature. But the Popsicle stick still had to rip him away, shame on her. that’s what he gets for removing his backing so quickly. What happen if you get hurt ? THE BANDAIDS WILL BE ALL USED UP ! Why, why are you so clever? The 2nd last panel was awesome! Just when I think this series couldn’t get any better, it does! love the band-aid.